The RSP-750 Series are a high power industrial AC-to-DC transformers with 750 watts of output in a 1U low profile (41mm) enclosed type package. They are switching power supplies with universal, full range AC input and an active PFC function. While all models are routinely updated, the RSP product line has been completely redesigned and updated. RSP-750 uses an innovative low power loss circuit topology which yields efficiency up to 92% in a small package. With a high power density of 9.4W/in3, the RSP-750 series can provide full output power in ambient temperatures up to 50 °C (122 ºF). Quick (±15%) fine-tuning of output voltage can be done by a rheostat located at the top of the terminal strip. There is also a "wide range trimming function" that allows output voltage to be adjusted from 40% to 115% of the rated output voltage, by adding 2~5.5VDC of external control voltage. Because of this, they can be used in the charging systems or burn-in equipment that may require a wide range of adjustment to output voltage and/or output current - Nice Feature! RSP-750 also employs an advanced digital control technique that uses a microprocessor for power management. 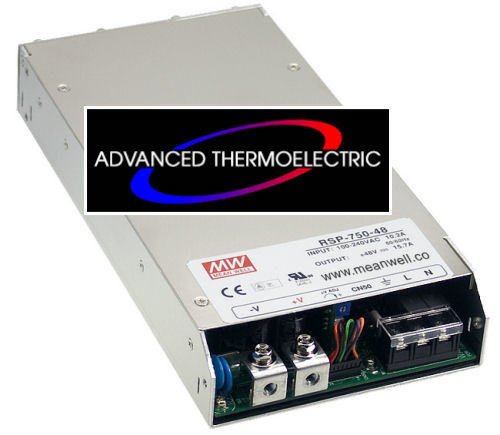 This significantly increases the flexibility of PSU control and reduces part count. For overload protection the RSP-750 series use “constant current limiting plus delay shutdown” which enables the unit to power capacitive/inductive loads and still provide full protection for customers’ systems. Other built-in functions include remote sense, remote ON/OFF control, 12V/0.1A auxiliary output, and DC OK alarm signal output (TTL signal). The series complies with UL, CUL, TUV, CB and CE regulations that ensure user safety. Applications include general industrial control systems, front-end power system, factory automation, military and industrial instrumentation, moving signs, telecom/datacom and signal, data storage, laser-carving machines, IC testing equipment, LCD panel burn-in system, battery charging and any product or application that requires a moderately high power AC-to-DC power supply.